What's one thing we're tired of hearing? 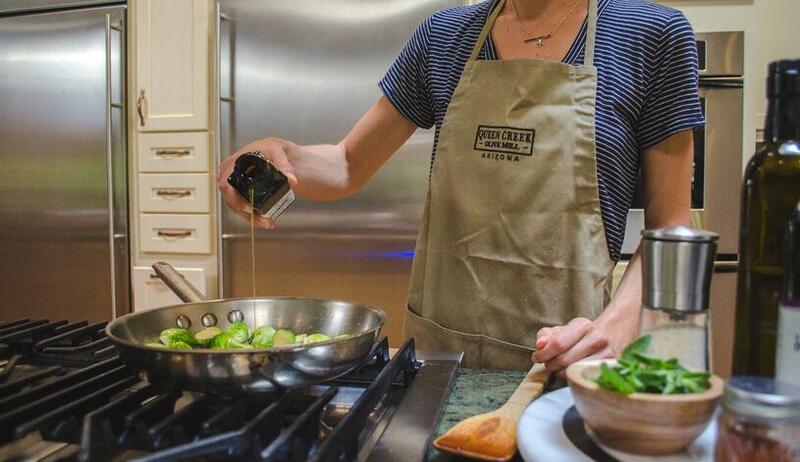 It's unsafe to cook with olive oil. It isn’t stable and oxidizes when heated, causing harm to the body. While this is true for other oils like canola and vegetable oil, I’m here to put these myths about olive oil to rest. When you are choosing an oil to use to cook, sauté, or fry with, you should look for one that contains low amounts of polyunsaturated fat. This is because these molecules, when heated, tend to oxidize quicker and go rancid. Instead, choose an oil high in monounsaturated fat with stability in high heat. The smoke point of extra virgin olive oil is 410 °F (210 °C). 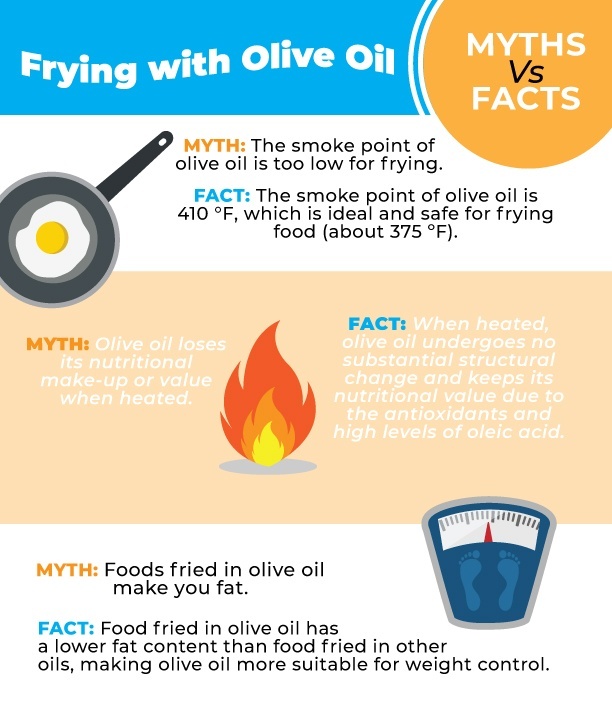 The smoke point of olive oil is substantially higher than the ideal temperature for frying food (which is 375 ºF) making it completely safe to heat. Why is olive oil better? There are a few reasons why olive oil outperforms other oils when it’s heated..and a few myths we need to put to rest when it comes to cooking with olive oil. The smoke point of olive oil is ideal for frying. Olive oil made up of mostly monounsaturated fat (about 75%) which helps stabilize it and stand up to higher heat. The smoke point of olive oil is 410 °F (210 °C), which is ideal and safe for frying. Oils high in polyunsaturated fats (see our no-no list below) oxidize too easily at high heat will release harmful free radicals. This can contribute to different diseases including dementia, cancer, and cardiovascular disease. Heat does not impact olive oil's nutritional make-up. Olive oil is packed with antioxidants called polyphenols which act to protect the oil from oxidation. The heat required to raise the temperature of olive oil high enough to fry food cannot change the chemical composition of olive oil and therefore keeps all it's nutrients intact. Olive oil tastes better...and looks better on you! Olive oil forms a crust on the surface of the food that impedes the penetration of oil and improves its flavor. Food fried in olive oil has a lower fat content than food fried in other oils, making olive oil more suitable for weight control. Not only can you fry with extra virgin olive oil, but you should. It stands up well to heat due to its monounsaturated fatty acid and polyphenol content and is a safer, healthier, and tastier choice compared to other oils. Do not mix olive oil with other vegetable oils or fats. Olive oil should be re-used no more than four or five times. Do you use olive oil to fry your food? Will you try it now?